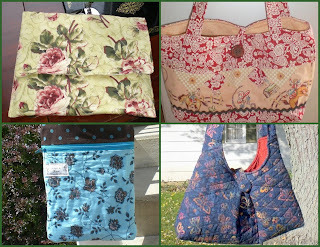 Karen, another Creative Blogger friend has some wonderful bags that you might like. Okay, I just wanted to drool myself. If you have one of the small mini notebook computers, Karen makes a very cute computer bag, it's the yellow with the roses. Don't anyone buy it because I may have to myself. Karen has a great blog that you can checkout HERE or I would highly recommend heading over to her Etsy shop HERE. I believe that Karen's love of fabric probably is very similar to my love of gemstones and beads. We are addicted and probably need help. Wow! Thank you so much for the wonderful post. I really appreciate your kind words.